This unique and beautiful tropical home offers 3200 sq ft of lovingly designed tropical comfort. Starting with essentials, nothing is missing in the huge open plan kitchen. Bake trays, multiple knife and fork sets, colorful crockery and more pots and pans than you will probably ever need. Bake, roast, fry, boil, steam , you can do it all. Next we go to care items that you MIGHT need. First Aid box Fire Extinguisher, cutting and other tools . A land line phone is provided for your use, to make calls anywhere in the USA, at no charge. Comfort and pleasure has been intended here: All furniture is lush, sturdy, comfortable and made from high quality materials. A tropical one full acre of beautifully maintained yard and garden add a remarkable ambiance to this alluring home. Many types of tropical fruit a re there for the picking, swaying palms, banana trees and lovely flowering plants adorn this one of a kind place. From inside the home on the upper lanai level, and from the outside deck-lanai you can see the Pacific Ocean. The sunrises and sunsets are a photographer's dream ! We have four bedrooms with five beds. First bedroom has a queen bed, second two full, third a king, fourth a queen and there is a master suite which can accommodate an additional three people . All our bedding is made from 100% high quality cotton. Each room has a special night time scent to spray on the pillow for a restful sleep. There can be found a wireless blue tooth speaker for the guest to download and enjoy their music direct from any smart phone. Bath and beach towels as well as a generous quantity of spare bedding are all to found next to the bathroom, clearly visible on the shelves. The Master suite is not included , but will be offered as an extra. There is a main guest bathroom, with tub, sink, shower, toilet. In the upper main area there is a toilet, with wash sink, there is a pool shower outside and an outside changing room area with toilet and wash basin. We have a desk and writing paper, a small screen TV with a DVR and a selection of videos and books, fiction and non fiction. For those guests who fund they had left behind their dental hygiene stuff, we have a selection of teeth brushes, floss, and mouth wash. You only have to ask and whatever you need will be provided at no charge. The pool with magnificent water slide, jacuzzi and sand pool for kiddies, are all here for your relaxation and pleasure. During your welcome tour we will show you how to operate everything.Our guests are free to pick fruit from the garden and enjoy. Honomu Place is close to Hilo town, a charming clean, quiet and interesting place more reminiscent of an older style area, though the gift stores, food shops, and farmer's market are all well stocked and staffed to provide whatever you might want . Honomu village is a landmark place, with a row of stores, including hand craft Hawaiian wood and other products. For activities, the famous Akaka Falls are a short drive away from our home. The Honomu Zip line in within walking distance, and there are beaches, parks, shopping centers, tropical gardens, scenic drives, the volcano, lava flows, rock pools, snow topped mountain, world class star gazing scopes, scuba diving, snorkeling, whale and dolphin boat rides and sightings, the famous Hawaiian green turtle, and so much more. Rain forests turn into ghostly lava scenes of devastation, and back to lush green forest. I am from England and have lived in the USA since 1983. My wife is from China and we have been together since 2003. We both love all the Hawaiian Islands, but have our hearts truly set with The Big Island of Hawaii, where we have spent many happy times since 2003. We give back to the local community and encourage others to. I used to be a teacher, am a musician of sorts (hobby), and love to read real books. This property stood out to us as a place with enormous potential. Our agent initially discouraged us from buying such a big place,(3200 sq ft and an acre ), due to the running costs. We had our hearts set on Honomu Place from the first glimpse. We have worked hard, and it's been a true labor of love, to make a vision become real. We wanted to have a tropical resort feel to our home, with rich and comfortable furnishings, to give a feeling of luxury and an ambiance of serenity. We have achieved this and all our previous guests have given us five star reviews, ( sorry, on different website ) we are new to Homeaway. Our strength is in the quality of the home, with gorgeous pool, jacuzzi, slde etc, and in the warm special Aloha welcome each guest receives upon arriving. The surrounding area is one of the most classically beautiful in all the Hawaiian Islands. Close by are waterfalls, scenic drives, palm forests, Rain forest, Zip line, breath taking views, swimming parks, and all the shopping places you could want. The home itself is comfortable and every area has a unique cared for ambiance that radiates welcome, relax, sit and be happy and calm here. Our pool has a water slide and adjoining sand paddle pool and hot tub ( jacuzzi ). Our garden has 8 kinds of edible tropical fruit and tropical flowers and trees. We have ocean views. We are world travelers and we know exactly how it feels to receive a kind, generous, thoughtful, embracing welcome. We go out of our way to ensure our guests have a unique and memorable vacation. We pretty well make CERTAIN it happens !!! Super modern electric stove with those flush amazing heat rings that cool when you remove the pots !!! Several beautiful sets..warm inviting high quality stuff here ! Huge modern kitchen fully...really FULLY equipped ! 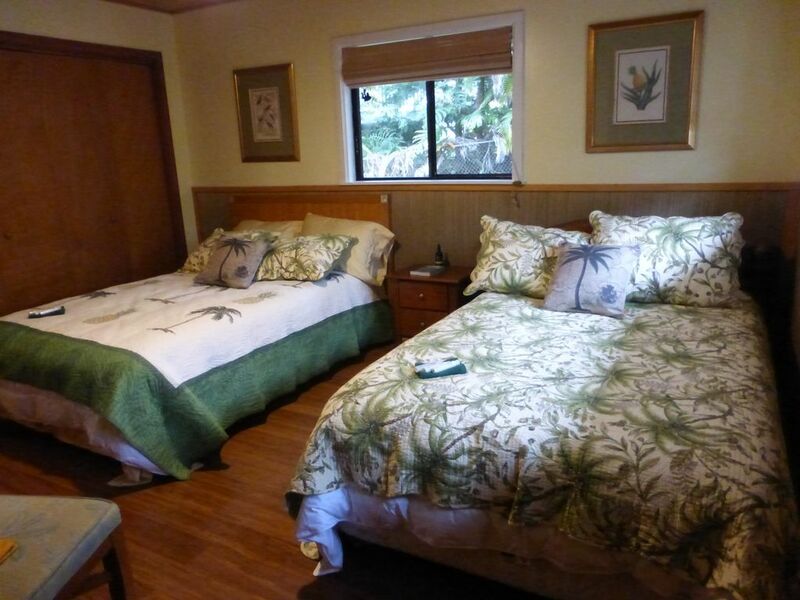 This was our first time in Hilo and we picked the perfect house for our two families. 4 adults, 5 kids, and a lot of fun. We picked this house because of the space and of course the pool slide. As much as my kids loved the slide, they spent a lot of their time sitting in the jacuzzi, while the adults lazily sipped Margaritas. I don't think there was a spot in the house that we did not use. We grilled chicken and steak on the upper lanai, lounged everywhere, cooked in the kitchen. The location was perfect for visits to Hilo, the volcanoes, and Akaka Falls, which is right up the street. Anthony was charming and easy to deal with. I can't recommend this property enough. So I chose this house for several reasons including not in the tourist zone and waterslide pool option. I felt so at home. The kids went to the beach on the last day but from sun up to sun down they enjoyed the water slide, jacuzzi, and sand pool. The little green lizards were an added bonus(I don't like insects) the flea market on saturday is a must, kula shaved ice is a must. The kitchen is fully stocked one trip to safeway for the must haves. We did pack our own cereal, snacks, capri suns and plates to save on certain costs. I thank you again for this opportunity to enjoy your home. For a super quiet getaway this is it! The pictures don't do it justice!!!! This place was amazing! Beautiful sunrises off the top deck and the slide was so much fun! So many areas to sit and relax inside and outside! Lovely large kitchen and dining area! Even More pleased that you wrote so elegantly about Honomu place. Thank you for your kind words and for respecting our home as if it were yours. Lots of room and fun!!! Outstanding correctly describes this rental! Space, comfort, beauty - and everything in between! We thoroughly enjoyed our stay at this house in Honomu! The spacious kitchen made preparing meals (from produce purchased at Hilo Farm Markets) a breeze. We had everything we needed and enough dishes to serve up our feasts. The layout gave each of us enough space to truly relax and enjoy the breezes. The pool! Oh my goodness, this added so much to our vacation. We enjoyed it every evening after exploring the island. The maintenance folks keep it clean (although we would have helped if we could find the net!) and perfect for our use. The slide is pretty epic - and fast! You definitely need the mats to use it. The views are terrific (ocean from one side of the house, mountains from the other!) Now that we are home, I am missing the evening chorus of frogs and the daytime music of birds - you truly feel like you are visiting the jungles when you are serenaded by the countryside of this rental. We highly recommend this property!! Thank you for making the celebration of our 30 years together so special!! Thank you for your great review and for being the kind of guest party we like the most. You left our home spotless, it was hard to imagine a large group was actually staying here. You would be very very welcome to visit Honomu Place again. We'll be sure to give you an honored return guest gift and discount. Thank you for the input on the game's. I spent a fortune on them and I suppose kids have whittled away at the ingredients!!!! My family and I loved our stay at Anthony's house in Honomu in mid-December. This house is truly a place to go to get away from everything. We were a party of 6 adults and 2 toddlers and had more than enough room. The grounds are huge with so many different spots where one could escape with a book or just be alone to meditate on the beauty of the surroundings. We loved how the kitchen, main living and dining areas were located upstairs with tons of windows letting in natural light. Hilo was about a 25 min drive away so we went there to stock up on food and happily relaxed at the house and enjoyed our own private pool and hot tub. The kitchen was well stocked with all the cooking tools we required. The surroundings are absolutely gorgeous, we spent many hours just having lovely conversation while staring at the view. We are early risers and we loved waking up with a cup of coffee in hand and marveling at the breathtaking array of stars one doesn't see in cities. We'd sit on the lanai or the sunny room off of it and watch the sun peak up over the ocean every morning. The short hike around Akaka falls was one of my favorite attractions on the Island and is only a few short miles from the house. We also stopped by Volcanoes National Park while in the area. We split our time in Hawaii between Honomu and a condo in the resort area of Waikaloa. The group agreed that we preferred the absolute serene lush beauty of Anthony's house in Honomu to the overly manicured resort scene. The Honomu house is in a very small, quiet town, away from city noise. We loved hearing the peaceful sounds of the wind blowing through the treetops and the chorus of frogs or birds. This was the first vacation rental experience for my mother as she has always been skeptical of renting one before. This house definitely won her over. She was enchanted by her stay and as we left I heard her fondly say, 'goodbye house, hope to see you next year.' Anthony and his house manager were both a pleasure to work with. We had one question during our stay and both Anthony and Monique were prompt in their reply. I highly recommend this property to anyone looking for a place to relax. We would absolutely love to return one day for a longer stay. Thank you so much and how charming that your Mother said her fond farewells to our home. I do EXACTLY the same thing when I leave a special vacation home. You would all be most welcome to return and we'll grant you our return visitor discount and extra welcome gifts.